It seems fitting to start at the beginning. At least the beginning of my design career, so you know how I got here. After leaving a brief career in education, once I realized my empathy for many of my “at-risk students” could not remain separate from my professionalism, I briefly worked as a desk-girl in a hair salon. I felt like this new job would be a perfect mental vacation, and a way to take some time to figure out what I wanted to do, career-wise, while still receiving a steady paycheck. One night I was drinking beers with a friend, in the garage of the first home I owned, with my now ex-husband. My buddy was remarking on how much positive change I had done with the house since we had moved in, on such a meager budget, in such a brief amount of time. “You should be an interior designer,” he said. Simply like that. It was like a flash of lightning for me. All my life I remember rearranging the places and spaces (and heavy old furniture), from apartments I had moved from again and again with my mother, and had even had a hernia operation at 8-years-old to prove it. Designing spaces (with what modest-second-hand-things I had), was a way for me to manipulate mood and have a sense of control over my environment, and a way to deal with the anxieties of my childhood. “I never thought of that.” I said to him, still in shock, because I had always wanted to be a teacher, or before that, I had wanted to be a “Psychologist to the Stars.” Either way, I wanted to help people in some way, as a career goal. But it was in that moment in my garage, that I realized I could take something I was really good at: creating a composed narrative with a space, and pair it with the psychological piece of making those feel relaxed in their own home, that I knew he was right. It couldn’t have been more clear. So, I went back to school. Fast forward to my first real job at an incredible high-end kitchen and bath design house. It was a serendipitous job opportunity where installing $100k+ kitchens was the norm. Although it was luxurious, and I learned so much, I still craved the emotional satisfaction I was looking for in a career. Turns out the universe knew that too. I was laid off during the market crash of 2008, and found out I was pregnant with my first child just a couple of weeks later. I was fortunate enough to be able to stay home and raise my daughter as if I were running a Montessori school for one. During the time I was pregnant, however, I started to very slowly trickle in my own clients, by word of mouth. My very first client paid me $10 an hour, and had a budget of $500 for goods and materials for a guest room that was completely blank, other than a box spring and mattress! I worked pregnant and determined, knowing that this first job, no matter how small, would parlay in to others. All I needed was pictures of what I could do—and this was a way to begin and establish a portfolio. Although I quietly, but steadily took in clients here and there over the years that passed, my main focus then was that of mothering my now 2 kiddos, partnering, and reworking our home(s), into places that not only reflected a sense of style but that were intended to grow in property value. My career was not at anywhere close at the top of my priority list. On July 22nd, 2015 that all changed. The lifestyle I was living would no longer exist, and it was time for me to put every single life skill I had ever acquired in to practice. After a 13-year-relationship, I became single. Initially while I was scrambling for a job I watered gardens, walked dogs, and sold my possessions, furniture, and jewelry, to make ends meet. Then one day I got a call to help a very established Real Estate Agent stage a couple homes while her usual stager was on vacation. I leapt at the opportunity and was thrilled to work with a team. Staging these two properties made me feel good and useful and valuable again. It felt like when I used to rearrange my friends college apartments, except I was getting paid for it! It was a dream. I loved being creative with other people’s things, while peppering in a few fresh items. Even more, I loved how the clients felt when they got home with how revived their homes looked. 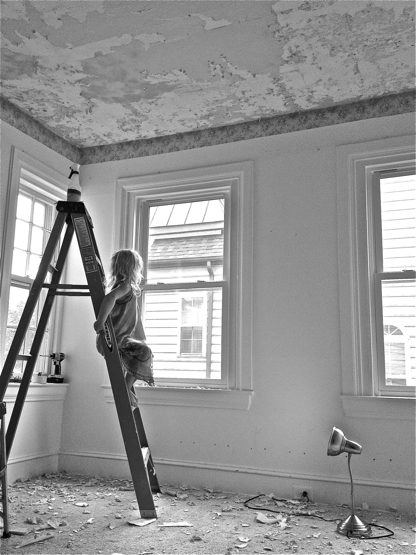 This was something I wanted to do regularly, along with interior design, and when I found out the original stager and this agent were parting ways, I was thrilled for the chance to take on the role and the financial stability for my kids and my future, that came with it. As I sit here now, in a different home, in a different headspace, in a different year, in a different stage of professional and personal maturity—from that evolutionary summer of 2015, I can say I am truly proud of the work I have done for myself, and for others. The growth and success of my business is something I only ever had a distant fantasy about when I was in my twenties. And here I am now, garnishing new opportunities every day, both big and small, to make people feel good about the environment that surrounds them. I love what I do. My clients’ budgets range from mini to mighty, but my goal for each of them is always the same: to feel at home, and to feel like their personal narrative is reflected. I do wish I had a personal assistant to do my dishes, put away my laundry, and wash my floors though, (because I am often exhausted between work, parenting, and seeing friends), but I wouldn’t change the busy path I am on one bit. And speaking of vision: those who know me best, know I have big but humble plans to not only continue to grow my business, but to more importantly grow my personal sense of achievement so that I may sleep well at night knowing I am living the life I have earned on my own, and that my children bear witness to it. I am pretty excited about 2018. "Things Are Easier Said Than Done."